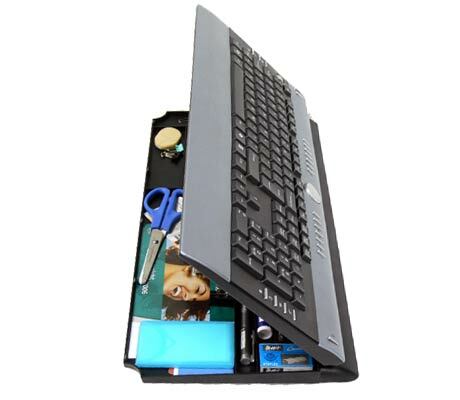 The Keyboard Organizer, For Clutter Junkies | OhGizmo! I bet if you take a look around your desk, you’ll be ashamed at just how much disparate junk is scattered all over the place: empty CD cases, scissors, that Scotch Tape you’d been looking for three weeks and had been in front of your eyes all along, etc. Well, don’t throw all that crap. Stash it in the Keyboard Organizer instead. It’s a simple corded keyboard with a storage compartment. It’s also cheap, at $25, and there’s word of a wireless version in the works. Does it work while ajar? I’m a major clutter junkie!